Zinc-plated European load chains provide increased resistance against corrosion and wear. Beaver Sales has released the Liftall range of electric chain hoists and motorised trolleys, which is the result of extensive R&D, culminating in a robust and cost-efficient hoist with many standard features that other brands only offer as extras. The Liftall range uses a reduction gear box that is totally sealed and filled with grease, keeping the components constantly lubricated. The gear box is also fitted with roller bearings for increased efficiency, reduced wear, longer life and quieter operation. The BEL Series hoists have an all-steel construction, with both 240V single-phase and 415V three-phase models available in capacities from 500kg to 3000kg. The standard lifts are 3m and 6m, but custom lifts are also available. Grade T(80) zinc-plated European load chains, for increased resistance against corrosion and wear, are fitted with zinc-plated, travel limiting springs and a chain inspection gauge allows the user to monitor wear and tear on the load chain. An overload clutch prevents the hoists from being damaged by overloading and also upper and lower limit switches prevent over-travel. The hoists have an IP54 protection rating against dust and water, while the motor is thermally protected and a heavy-duty DC brake provides fast actuation. They are controlled with a 24V, IP65 pendant unit, but remote control options are also available. The Liftall BET Series motorised electric girder trolleys are available with capacities of between 1000kg and 3000kg and have planetary gear boxes as well as self-adjusting automatic safety brake systems. Each is controlled with a five-button, IP65 pendant control and comes with flanged wheels and side guide rollers. Tipping prevention pins are fitted to each unit as are anti-drop plates with rubber buffers or stoppers. A pressed steel outer casing protects the trolleys and a powder-coated finish provides durability. All gears and pinion shafts are made from high-quality, heat-treated alloy steel. A hanger suspension bar allows closer coupling of electric hoists. 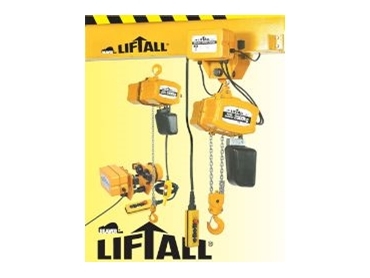 The Liftall range of hoists and trolleys has been manufactured to meet the Australian Standard AS1418.2 – 1997 and every unit comes with a test certificate showing that it has been individually tested to the standard. An emergency stop, via a main contactor, is fitted as standard on all models of Liftall hoists and trolleys. The Beaver Liftall range is backed by Beaver Sales’ branch network throughout Australia and New Zealand, providing prompt and efficient service and repairs. For more information please contact Beaver Sales on 1300 783 606 or visit www.beaver.com.au.